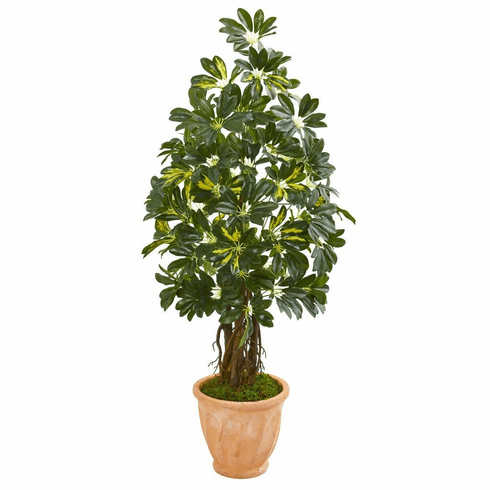 This 4.5’ schefflera artificial tree will bring both a clean and fresh aura to your space with its realistic, lush variegated green leaves. Contained within a minimalist terra cotta planter, use this ornament to fill a wasted spot in your dining or living room. Or place it on a simple wooden table for an added height in any space. Includes a bed of faux green moss for a complete arrangement. Height: 4.5 Ft., Width: 24 In., Depth: 24 In., Color: , Pot Size: H: 10 In. W: 11 In. D: 11 In.